IBM® MQ Advanced is our leading IBM MQ on premise software offering. It is a comprehensive solution that provides a stable core messaging foundation with end-to-end encryption, access to real time data, and the ability to transfer file content data over that messaging network all in one product. How does managed file transfer operate in IBM MQ Advanced? IBM MQ Advanced offers a flexible file transfer gateway that integrates with your heterogeneous infrastructure. It’s reliable technology that supports fast, cost-effective file transfers. Integrated administration tools that help to manage and customize your setup are included. IBM MQ Appliance provides the application connectivity performance of IBM MQ software in a physical messaging appliance. It offers rapid deployment of enterprise messaging with easier administration. Performance and message throughput are optimized for the appliance's capability and configuration. How is IBM MQ Appliance available? It is available in two options: IBM MQ Appliance M2001A for enterprise workloads and MQ M2001B for smaller workloads at a lower price. It is ideal for existing customers who want to consolidate their MQ infrastructure, or new customers who want to get started quickly without investing in MQ experts. What is end-to-end encryption in IBM MQ? Security is essential to protect data at every stage. IBM MQ Advanced offers message-level security to deliver data protection for your point-to-point messaging infrastructure. Data encryption and authentication provides security-rich data transport throughout the messaging cycle. How do I get end-to-end data and file content data encryption on IBM MQ? IBM MQ Advanced, IBM MQ Appliance, and both MQ Advanced for z/OS products (IBM MQ Advanced for z/OS, and IBM MQ Advanced for z/OS VUE) provide encryption of message data, as well as file data content capabilities. What is the real-time advantage in IBM MQ Advanced? MQ Advanced uses the protocol, MQTT for real-time access to mobile, IoT and sensor data. A gateway for mobile messaging enables mobile devices to easily connect with existing applications. It includes flexible message processing designed specifically for mobile device messaging and connectivity. Can I run IBM MQ on the mainframe? IBM MQ Advanced is available on z/OS, with the VUE version including MQ, managed file transfer, function end-to-end data encryption, and additional capabilities provided by the Connector Pack. Is IBM MQ available in the cloud? 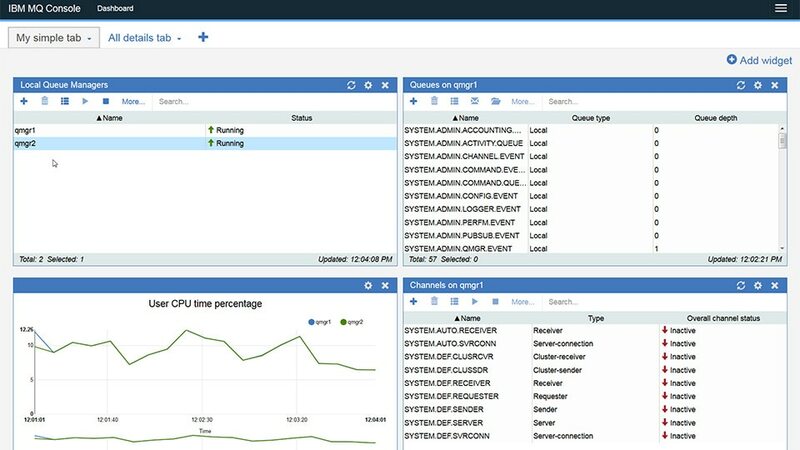 You can run IBM MQ in a Docker container on IBM Cloud. IBM MQ images are also available on Microsoft Azure and Amazon Web Services. Can I transfer files over my IBM MQ network? IBM MQ Advanced and IBM MQ Appliance include the ability to transfer files over the IBM MQ network, although files cannot be stored on IBM MQ Appliance. It is also possible to transfer files on z/OS through the purchase of IBM MQ MFT, IBM MQ Advanced for z/OS, or IBM MQ Advanced for z/OS VUE.